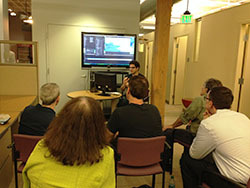 Last week we hosted the Boston Avid User Group in our office. It’s become an annual tradition filled with local editors, demos, networking, food, and good cheer. 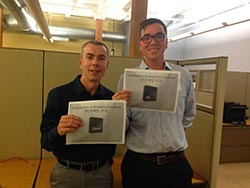 The Boston Avid User Group (BAVUG) has been around since 2004 and is dedicated to advancing the professional growth of editors, students, and enthusiasts in the New England area. The group meets 8-10 per year and invites guest speakers from the creative and technical communities to share their experiences and showcase new solutions. Paul Ezzy, our resident Boris TV trainer (and QA engineer), demoed BCC 9 AVX for the group. The excitement over BCC Lens Correction was echoed by Justin Hardison, a Video Producer at Liberty Mutual Insurance who also uses Avid in his personal work. “The fact that I do work with DSLR and GoPro in the same projects, where half the footage is in a wide angle format, makes me love how this effect can match those clips easily,” adds Hardison. The addition of many more real-time effects and the FX Browser™ were the highlights for Bill Kenney, a freelance broadcast and corporate editor. “It’s great to quickly preview effects on my footage rather than on an image ,” notes Kinney. After wrapping up the demo and fielding questions from the attendees, the night ended up a fun note with the raffling of a BCC 9 license, a RED 5.5 license (the successor to Avid FX), and a Boris FX t-shirt. Congrats to the winners! We look forward to next year! Interested in joining BAVUG? Learn more. Want us to demo at your next user group? Email Jessie Electa Petrov, Director of Marketing, jessiep@borisfx.com .